RDF is blessed with a brand new partnership with a home decoration store named Evolution, located on Road No. 3 in Banjara Hills in Hyderabad. They have graciously opted to display an RDF donation box at their front desk, with all proceeds being donated to RDF schools. 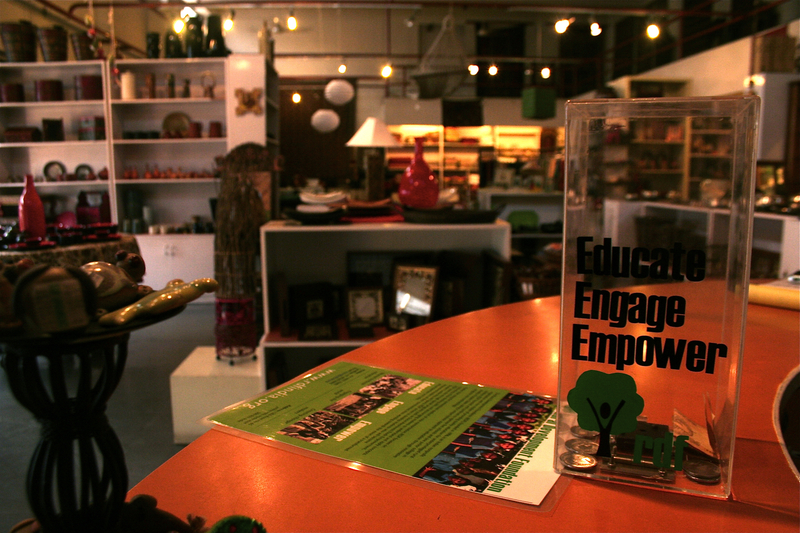 We encourage everyone to stop by Evolution – a beautiful store worth visiting for any home decorator or gift giver! RDF is hopeful for the success of this inaugural donation box and plans to implement other boxes throughout the city as well. Oakridge School donation to fill RDF libraries! 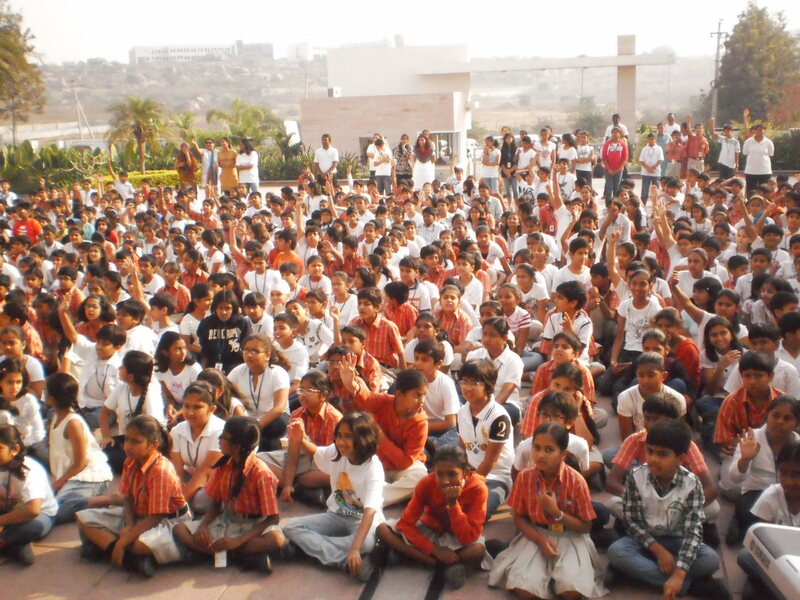 On February 19, Oakridge International School in Hyderabad ran a hugely successful book donation drive. A few weeks after Oakridge 5th and 6th class students received a presentation about RDF, they took the initiative to hold a school-wide drive to donate to RDF schools. 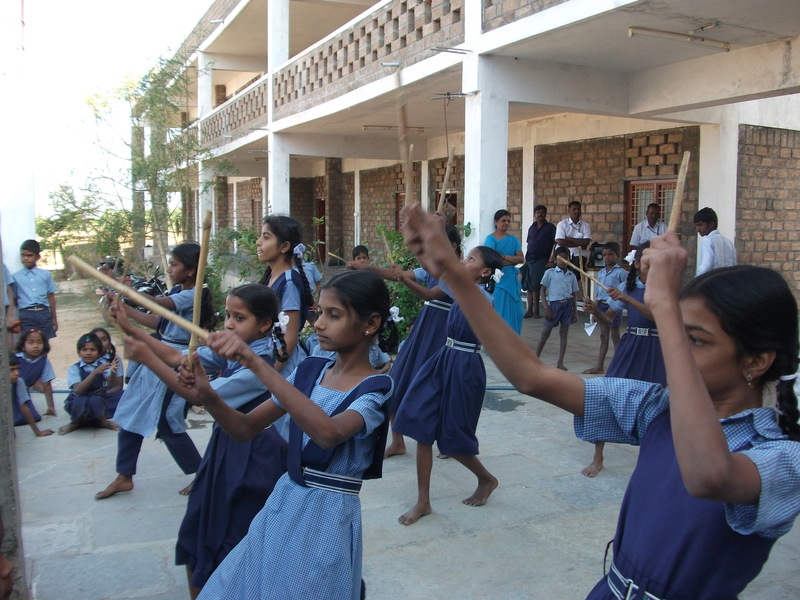 Many students felt moved by RDF’s mission, and wanted to contribute in a tangible way. 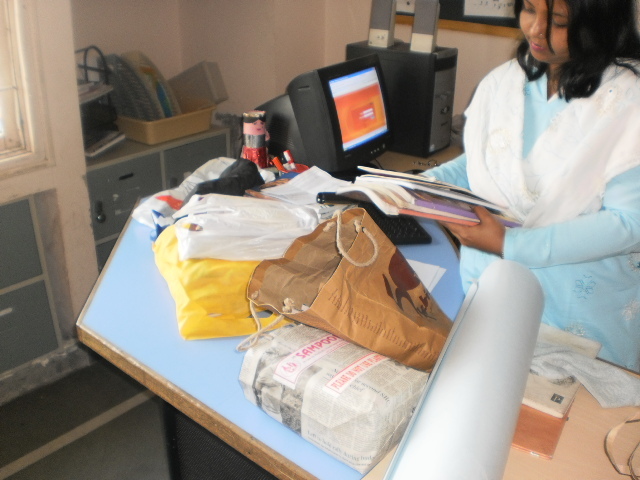 Students in all classes contributed, and almost all of them gave a minimum of 5 books. Another motivation was that students were allowed to wear jeans and white shirts for a day, and Oakridge was full of jeans-wearing students that day. Students gave story books written in English, Telugu and Hindi, donated in eco-friendly bags, along with stationery and some soft toys for RDF Nursery classes. 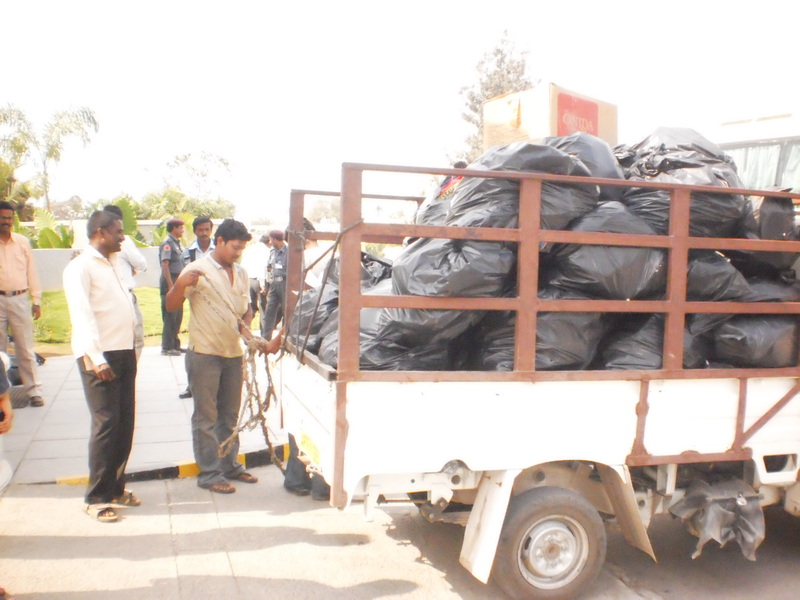 In total, there was a full truckload of donations given – a donation that will last for many years at RDF. The books will go towards filling RDF libraries and classroom mobile libraries in all RDF schools. The donations filled up the back of an entire truck! RDF looks forward to a continued relationship with Oakridge International School for many years to come. Satyanarayana Janagonda joined RDF May 3, 2010. He teaches Science to 4th through 7th class. His favorite part of being an RDF teacher is that he loves teaching and feels wonderful contributing to the development of the village through education. When asked what areas he and RDF could improve, he says he hopes to improve his knowledge and skills, especially in English. He hopes RDF continues to better student lives. Many of the students in the area come from farming backgrounds whose lives are uncertain due to droughts and crop failures. Education helps break this cycle and he’s excited to be a part of it. A visit to RDF Narsimpalli School this month will inevitably lead to an impromptu talent show as students are in full swing preparing for their Annual Day celebration on February 20th. Annual is a day for students to showcase their talents and celebrate their successes in the academic year. Every year, community members and parents from the surrounding areas are invited to partake in the celebrations and have an opportunity to learn more about the accomplishments of their local students. RDF wishes successful performances for all students on Annual Day 2011!! RDF schools are proud of their environmental awareness; students are taught not to waste a piece of paper, a drop of water, a grain of rice or a watt of power. Now they have a continous supply of ‘city trash’ for use in classroom group activities. Our Place – a popular Hyderabad restaurant has agreed to donate its used table mats to RDF schools for as long as the schools can make use of them! What started as an experiment has developed into a long-term project with the restaurant agreeing to recycle their used paper table mats for a good cause. Instead of being disposed of, they will be collected and stored for use by RDF schools for arts and group activities in the classrooms. It’s a practical example of city trash becoming RDF school treasure! 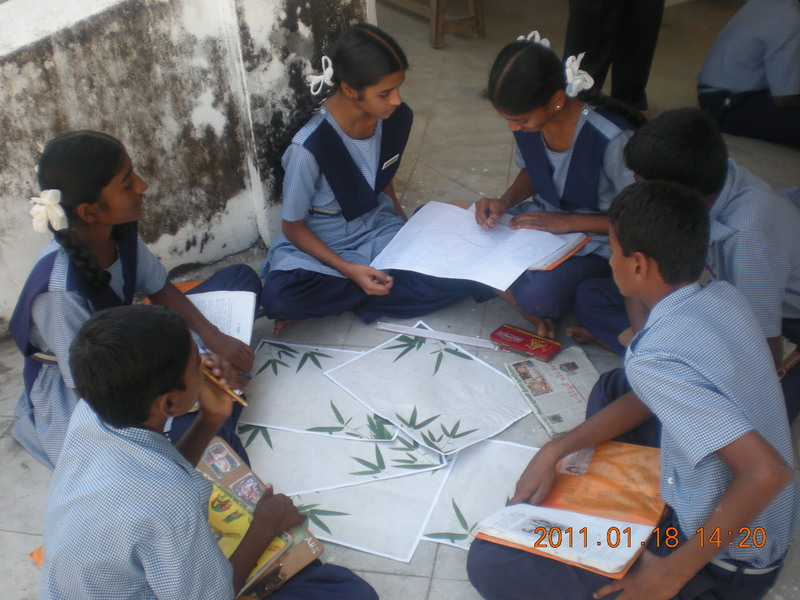 It may also be a vision of the future with rural and urban India finding innovative ways to collaborate. Johanna, a Bridges to Understanding volunteer at RDF Matendla School, writes about her experience meeting Babu, an RDF Matendla School alumni student. 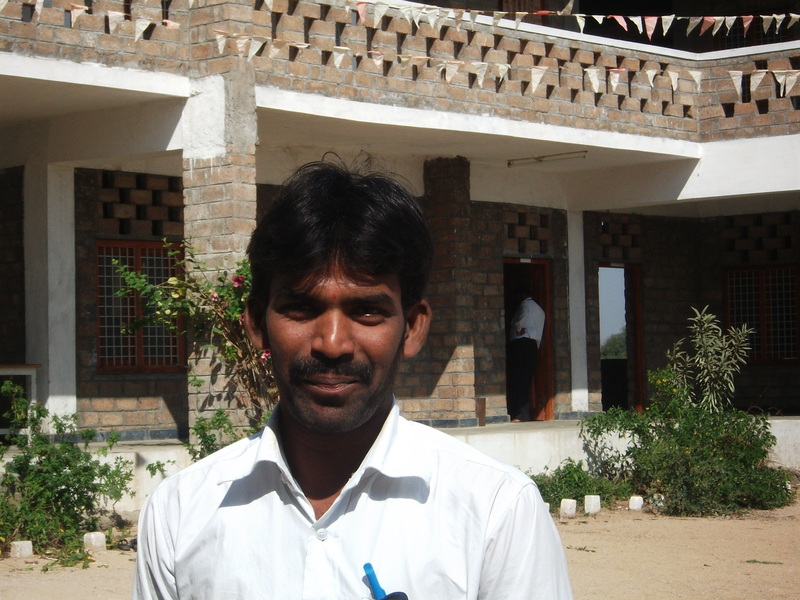 Babu Daripally is 17 years old and graduated from Matendla in 2010. The young boy approached us at Matendla School. He was eager to meet us and although only a few words were exchanged, he left us speechless. He sang us a song; Amma (Mother), a Telugu folk song honouring the important role of the mother. Babu has the most beautiful, strong yet soft voice, and his performance was full of emotion. Babu recently lost his father and is now living with his grandfather. Although he has been singing since 3rd grade and won several awards for it, unfortunately this has not been encouraging enough for him to pursue a dream of becoming a singer. He is a sensible village boy and is aware of the uncertainties of a world of singers. His life goal is to become a doctor. Archery stars Chandulal G, Prasanna K, and Lavanya N.
Archery is not a sport you associate with rural India but thanks to the fame of a former RDF archery student who made it to the 2008 Beijing Olympics, it has become firmly established in the remote rural village of Kalleda. 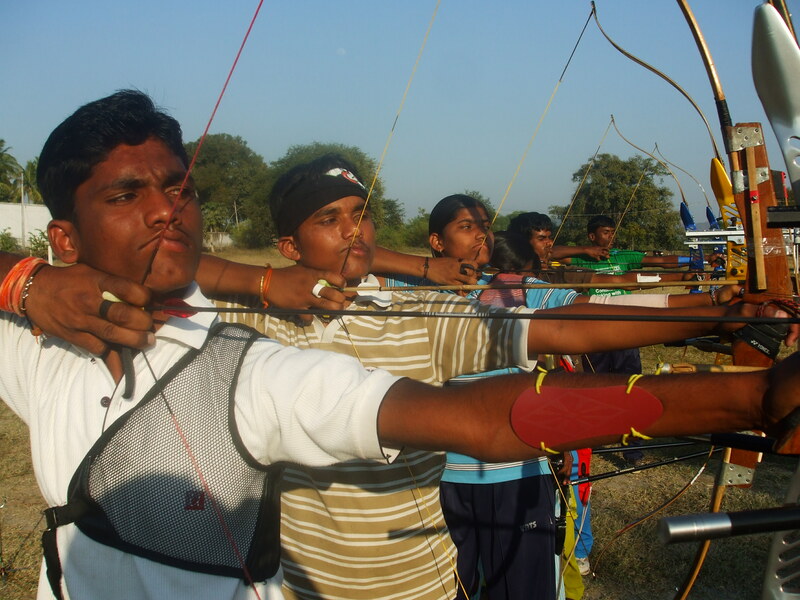 It is being kept alive thanks largely to the passion of JC archery coach, Gopi Singh a former international archer for India, who coaches and support students from Kalleda School and the nearby Junior College, whenever they show any promise. 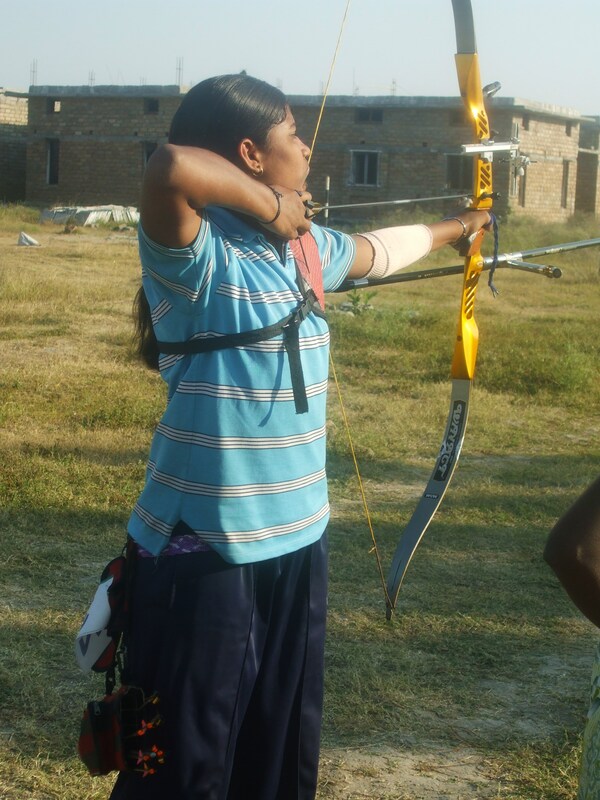 Seventeen year old Lavanya, in her first year of a commerce, economics and English degree at JC who won a gold medal in the 2009 National School Game Archery Championship at team event and two bronze medals in individual events. Her parents are very poor agricultural workers and her goal is to become an international star. 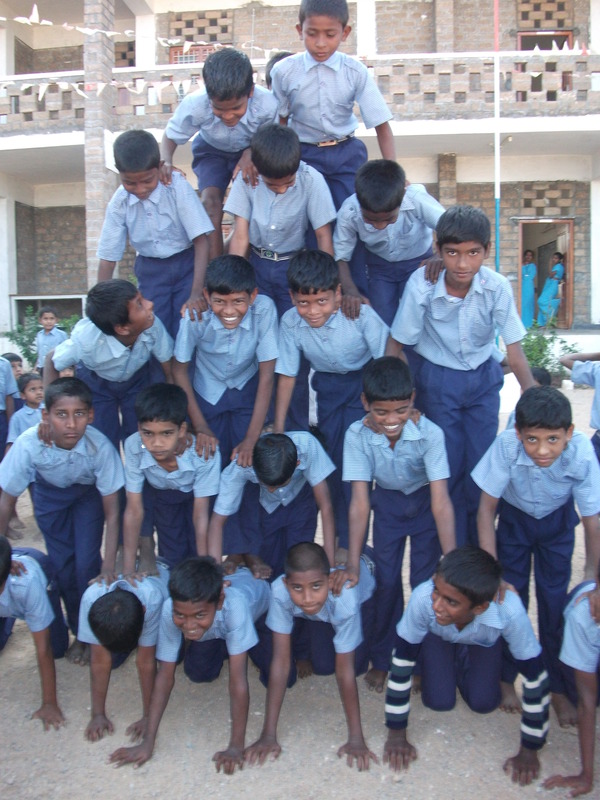 Sixteen year old Prasanna Kumar was placed second in the 2010 Rural National Games after his success at state level in the sub junior events. He is in his first year of a combined physics and maths course. 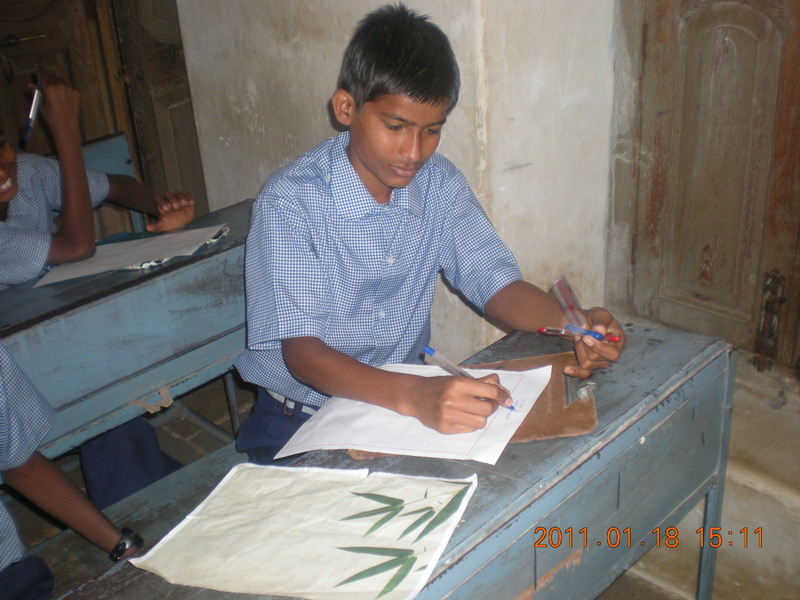 Youngest student, G Chandulal in class 9 at Kalleda School was the best competitor in the sub junior state Championship 2011.and also a silver medalist in the team event at Mini-Sub junior National 2009.Outside school, he spends time helping his father on the family’s small farm-holding.